First, we set up an appointment with you, to discuss your food preferences and how often you'd like Kathy's Cuisine to cook for you. Personal chefs generally offer meals plans, the most popular is the 5x4 - translated, that means five meals, with four servings of each one. We'll ask you for a grocery deposit, to use when we grocery shop prior to coming for a cook date. We'll prepare your five entrees, each with vegetable and starch side dishes, and generally a salad and dessert for immediate use. When we leave, one meal will be ready-to-serve, two in the fridge and two in the freezer - either family style or by the single serving (as in the photo above; this particular meal includes a roasted chicken breast over herbed bread stuffing [made in the slow cooker to the right] with cranberry apple sauce and sauteed squash). Most personal chefs charge per the number of entrees they prepare (and some just prepare one entree and then charge additionally for each accompaniment). $40 is our hourly rate; and how much time it takes depends on what you order and how long it takes to cook. Cost per serving ranges from $5.75 - 17.50; your menu options are often based on savings we can accrue from weekly specials at local grocery stores. (who holds a Masters Degree in Clinical Nutrition from Maryland University of Integrative Health), who can analyze our menus to be sure we're meeting your maximum health requirements. 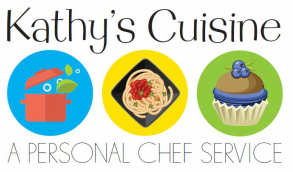 When my sister in law was diagnosed with cancer and her husband had special diet, we called on Kathy’s Cuisine. After questioning likes, dislikes, and special dietary needs, she filled the freezer with 21 meals that could easily be microwaved as needed. The prep time took a matter of hours and did not inconvenience me. Not only were they nutritious-they were delicious!